Since it is my birthday, I am giving you a present. I decided to get my crayons out and make a Cheshire Cat wallpaper. This is from the concept art that American McGee posted on his blog. 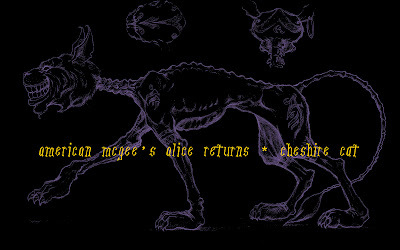 Of course, it's the American McGee's Cheshire Cat because I already posted one for the Tim Burton movie (rather sneakily I might add) here: Cheshire Cat wallpaper. Enjoy and please don't sue me.